Regional Screen Scotland (RSS) said Creative Scotland intends to provide it with a total grant of £620,350 for April 2018 to March 2021. Highlands and Islands Enterprise (HIE) will also give a total of £75,000 over the same period. 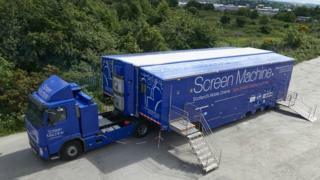 RSS operates the mobile cinema the Screen Machine. The service was originally started in 1998. The current vehicle, which has been in use since 2005, was fully refurbished last year. The cinema tours the Highlands, Inner and Outer Hebrides and Northern Isles. RSS said: "We're delighted that the continuing success of the Screen Machine, which visited 51 different locations in the last year, has been so firmly endorsed by our two key funders."